For some reason I find it very hard to find a mascara that works for me, that gives a finish that I want without clumps or too much volume so they stick together that last well. I probably have expectations that are too high or I don’t want what a lot of other people do. At the moment I have about six mascaras I want to review, some from Christmas that I haven’t really tried and others that are my current favourites so I thought I’d try some of the untried ones to see what they’re like. This is the MUA Mega Volume mascara in black waterproof, I got it in the summer Capital FM box from Latest in Beauty though it wasn’t one of the reasons I bought the box. It says it’s in the Make Up Academy Professionals range within MUA, though I’m not sure about the difference between this and normal MUA. I have liked the MUA palettes I own so I was happy enough with this, especially going by the price of the range. In Superdrug they don’t have this waterproof version but the normal one is £3.00. I thought if it works well then this costs less than a quarter of my current favourite waterproof. I have found it on the MUA website too, it says the waterproof is available but I can’t see it on there, it also says they cost £3.00. 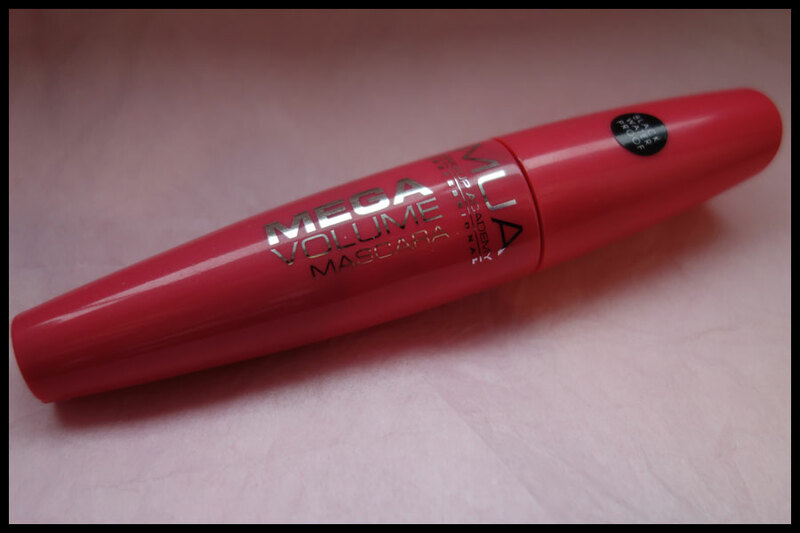 The outer packaging of this mascara doesn’t really stand out, it’s a nice shape to hold and the bright pink does stand out against the rest of my makeup, it just doesn’t amongst my mascaras where bright colours seem to be the go to packaging now. 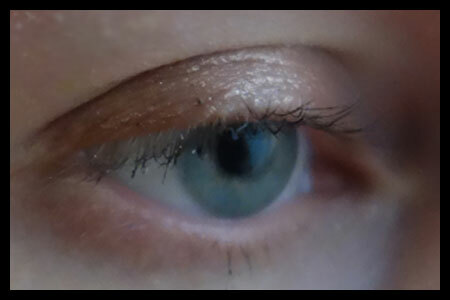 It has a bit of a shimmer to it which is nice, maybe a pale blue duochrome, though it’s very subtle. The fact that the writing is in silver is slightly annoying as it doesn’t matter what angle or lighting I use it reflects it so much it does not photograph and can actually be hard to read in person. 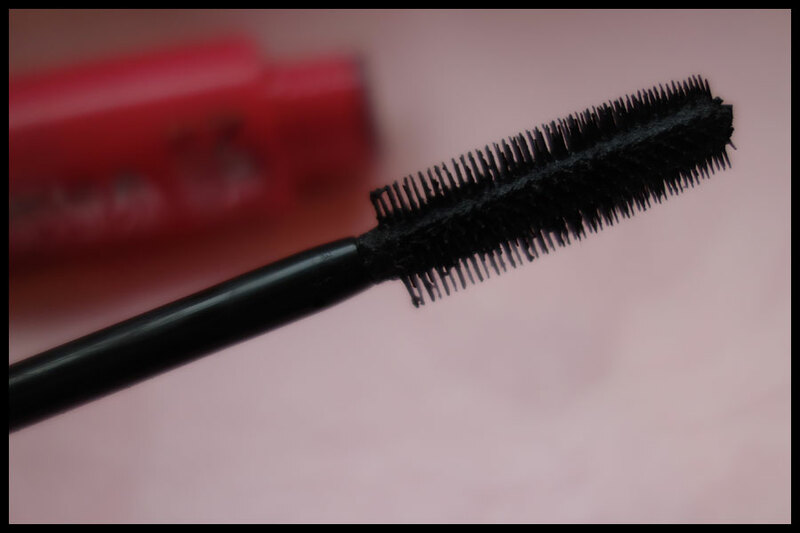 One of the main things I have against a lot of mascaras is the wand, I like the plastic ones with plastic teeth or spiky bits rather than the fibre ones you get. This brush is amazing, it has fine plastic teeth with a small gap between them which coats the eyelashes very well. I’m tempted to keep it for other mascaras as well when I finish this one. The stick part of it that it’s attached to seems pretty long and not the easiest to control but I think it’s a fairly normal size, it’s just that my current favourites have shorter tubes. Onto the product itself which I had some fun playing with. I thought I’d try it with one layer first which only coated the eyelashes and added colour which was exactly what I want from a mascara. I then tried adding a second and third layer, each of them did add a bit more thickness but still not the volume I expected. Even with three layers though there were no clumps at all, there were a couple of blobs as I applied it but they were easily brushed off with the tip of the wand. This photo shows the three layers, I found it so hard to get an angle that shows the mascara well, I hope it shows in here. After five hours of wear it was still sticking and no melting on the bottom lashes which is where a lot of my favourites in the past have failed me. I then thought I’d give the waterproof side of it a test. I ended up splashing my face a few times with water and even wiping it dry with a towel and it still looked good to me. 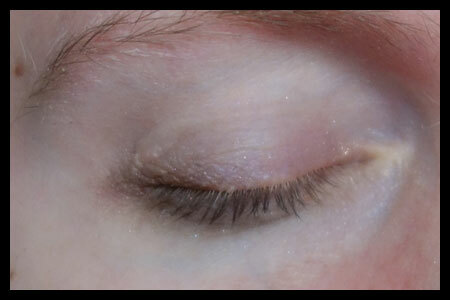 I’m not sure if there’s much difference between the first photo and the second as far as mascara coverage goes but it was definitely still colouring my lashes as they’re naturally a mid brown sort of colour so the fact they were still black after that says to me it was still holding on. Overall I would say this mascara really impressed me. It lasted well, no melting even though it was a slightly muggy sweaty sort of day and survived being splashed and rubbed. I did have quite a bit of difficulty getting it off my eyelashes at the end, it took five or six wipes with my eye makeup remover whereas most of the others take two or three but if that’s what it takes to stick then I’ll put up with that. This has really made me want to give some of their others a try, especially if they come out with colours besides black as I can’t see a normal black being better than this waterproof version. I have found the brown version online but I’d rather see what the brown looks like in person as I’ve seen such a range of colours called brown in mascara. If you can find this waterproof version or buy it online then I would say go for it if you don’t expect too much as far as volume goes. It did add volume to me, maybe twice the thickness when I had the three layers, but not the huge amount I’ve seen with other mascaras. Although this was perfect for me I know it’s probably not the best thing if you buy something called Mega Volume. I think it’s one that you could build to quite a few more layers as there was no clumping for me with three layers and the individual lashes were well coated, you could maybe get away with five layers, or possibly more if you were careful and good at applying mascara. I haven’t tried the lipliners but the eye shadows and blushes are good too. It’s definitely a company that I’ll be getting more from, I’d sort of forgotten them since other newer companies arrived.